Do you want to bring a Japanese-style dish for a potluck party? Potluck food should be easy to transport and easy to eat. Here are some ideas. 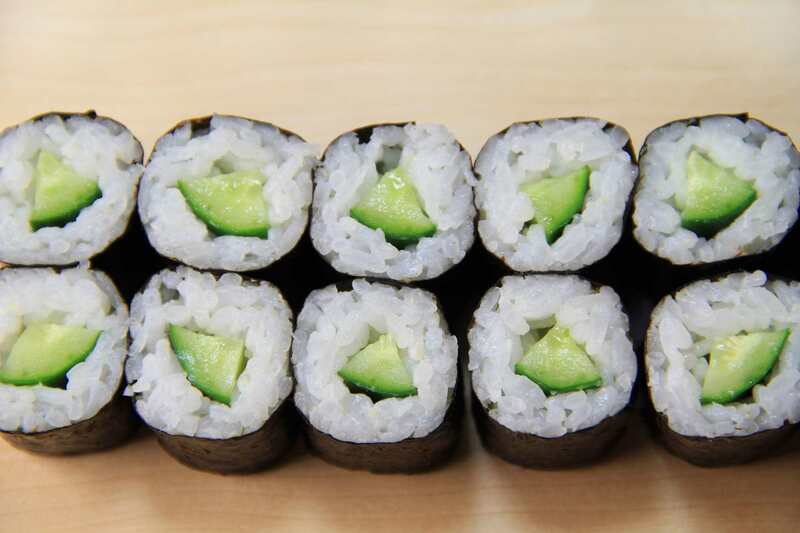 This sushi is quick, easy and healthful. It isn't made with raw fish, so you can safely bring to a potluck. Think about adding dreamy roasted garlic hummus, chopped roasted red pepper, and tangy feta cheese. Serve soy sauce and wasabi on the side. Yakisoba is a fried noodle with vegetables and meats. It's often cooked on BBQ in Japan. You might want to reheat yakisoba in the microwave before serving. Yakisoba is perhaps one of Japan's best-known street foods and it literally means "grilled noodles". While most people in the US know the term "soba" to refer to buckwheat noodles, in the case of yakisoba, it's actually made with ramen noodles. Inarizushi is known as brown bag sushi which rice is packed in seasoned aburaage (fried tofu) pouches. Aburaage has a slightly spongy texture. Because it’s deep fried, it can be pretty greasy, so it’s often prepared boiled in hot water first. It's easy to eat. For Inarizushi, Aburaage is cooked and seasoned very sweet. You can use regular white sushi rice to fill the Aburaage, but adding cooked vegetables mixed in the sushi rice makes it even more tasty. Rice balls are called onigiri in Japanese. Rice balls are usually shaped into rounds or triangles by hands. Use your favorite fillings or toppings. These little, flavored rice balls are made with sushi rice, but the rice is not fanned and seasoned with rice vinegar and sugar as it is in sushi-making. Instead, the rice is simply salted lightly. Onigiri, on the other hand, makes use of leftovers and other ingredients you might have around, often hiding them inside the rice.